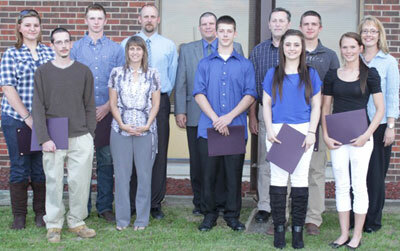 CAPTION: Grand River Technical School recognized seven students during the Tuesday, April 17, meeting of the Chillicothe R-2 Board of Education. They were Ty Coats (Braymer), Marc Jungles (Linn County), Hayden Hibner (Meadville), Park Sinclair (Tina), Katie Ireland (Trenton), Danielle Akers (Chillicothe), and Cori Locker (Southwest Ludlow). 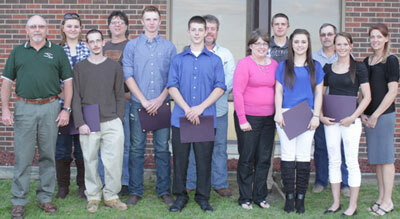 Students include: Ty Coats of Braymer, Building Trades program; Marc Jungles of Linn Co., Welding program; Hayden Hibner of Meadville, Welding program; Park Sinclair, Industrial Maintenance program; Katie Ireland of Trenton, Collision Technology program; Danielle Akers of Chillicothe, Child Care program; Cori Locker of Southwest, Health Science Technology and EMT programs.